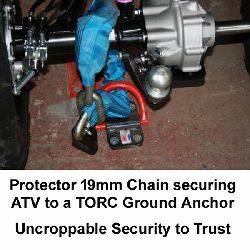 Protector 22mm High Security Chain - Sold Secure Diamond rated for Motorcycle this chain is guaranteed uncroppable with hand bolt croppers. Like our 19mm range of Protector High Security Chains, these 22mm Protector Titan chains are manufactured from high-grade European steel, and are treated with the same precise and proven specialist heat treatment and finishing processes in the UK. 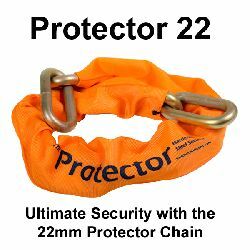 The Protector 22mm Chains are guaranteed impossible to crop by hand and have achieved SOLD SECURE MOTORCYCLE DIAMOND acreditation. 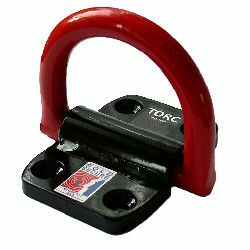 There are many Youtube hosted videos showing chunky but inferior chains being cut in seconds with bolt croppers, ...but you certainly won`t see our Protector 22mm chains being bolt-cropped! 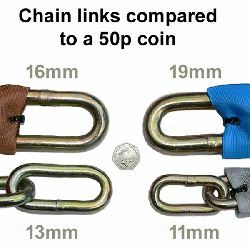 This is a very chunky chain which weighs in at 8.5kg per metre length, so it`s obviously not the type of chain to carry with you to chain your bicycle to a lampost while you go shopping! 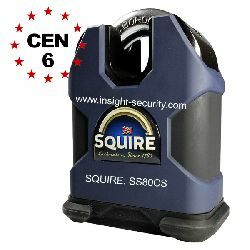 and you will obviously need a suitable padlock to go with it which offers a similar level of security to the chain itself. Which padlock to use with this 22mm Chain? 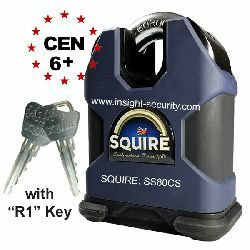 Of course, security chains as robust as this require a serious padlock to maintain the overall performance of the security system, which is why we recommend the Sold Secure Gold CEN6+ rated Squire PD SS80CS Close Shackle Padlock with NW4 cylinder. other lengths are available so if you can`t see what you need, call our friendly team, we`d love to help, t: 01273 475500. ...so this is a heavy as well as a bulky chain. Please Note; Chains over 3 metres in length are normally only required for securing heavy plant, etc. and so are supplied unsleeved as standard. Should you require sleeved longer chain, please call to discuss your requirements and the extra cost of sleeving. Sold Secure is an independent British security testing and approvals organisation that awards Gold standard to the highest security products, with Silver and Bronze for lower grade products. Motorcycle Gold is a higher rating than Bicycle Gold; Caravan Gold is a higher rating than Motorcycle Gold. 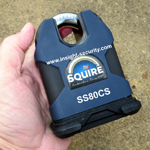 Sold Secure Chain Ratings: The Sold Secure test regime has been updated to take account of the higher ratings achieved by the 16, 19 and 22mm chains.